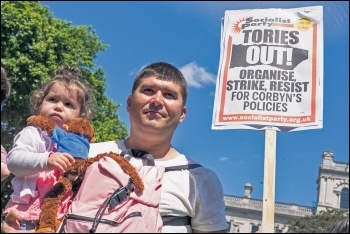 Socialist Party :: Blairites go on saving Tories - boot them all out! If it weren't for the covering fire provided by Labour's right wing, then the Tories would have been pulled apart by Brexit and the failure of an endless string of policies like prison privatisation. Instead, we've had Blairites riding to the rescue of the Tories every time Corbyn gains ground. Nothing will make them stop. If Labour is to be transformed into a party that fights for working class people, the right must be kicked out. The latest proof is provided by millionaire heiress and Labour MP Margaret Hodge. Despite screaming at Corbyn, calling him an "antisemite and a racist" in the corridors of parliament, the Labour Party has dropped plans to discipline her. How does she show her gratitude? She goes on national TV to compare her treatment to the regime in Nazi Germany! Theresa May must be so grateful. The right-wing saboteurs must be booted out, or Corbyn's Labour will never look like it could credibly stand up for working class people. Deselection of Kate Hoey and Frank Field, who rescued the Tory government in a vote on its Brexit policy, would be good start - but must be accompanied by mandatory reselection of all MPs and representatives. Without the constant undermining of Umunna, Leslie, Hodge and co, Corbyn's message would make a much bigger impact on the working class. Pro-Remain Tories, Blairites and Lib Dems rub shoulders and again threaten to form a new party. Multimillionaire capitalist Simon Franks has even announced he wants to launch one - 'United for Change'. But what policies would these neoliberal politicians be standing on? Privatisation, austerity and war? That is not a popular basis for a new party. In fact, all the establishment parties face crisis, because mass support just doesn't exist for the misery their ideas have caused. The leadership of Labour and the unions must seize their opportunity now, or risk gains by the populist right. Bold socialist policies, a programme for the democratic transformation of Labour, and decisive, coordinated strike action can bring this hated government down.